By investing hundreds of hours researching and testing, we have come out with the best branded double strollers just for you. Have a look on the following chart of comparison and guide to choose the best double stroller to fulfill your needs. Would You Like to Use It Until Your Kids Start Walking? BOB Revolution SE Duallie Stroller is the bestseller indeed. It is equipped with a lot of convenience and useful features. Generally, it is designed to make the lives of parents easier and you can easily manage your kids when running errands and going outdoors. You can also do exercise, grocery shopping or take a stroll in zoo or park. This stroller has three swiveling wheels and can completely rotate without any problems through tight corners or curves. The rear wheels are designed to run on any uneven surface and they are wide enough. You can easily lock the front wheel in forth position to get added stability while jogging in rough or uneven terrain. 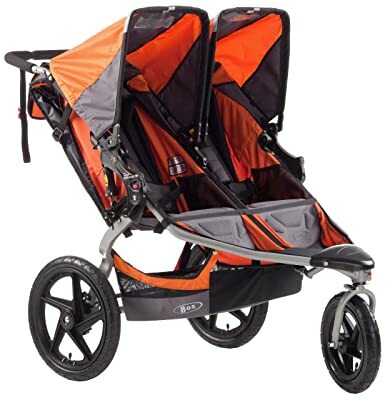 The stroller is loaded with easy-to-adjust suspension which has shock absorbers to provide smooth and comfortable ride experience to the babies even while jogging on the busy street. It comes with 5-point harness and features fasteners to tighten your baby with pull rings. BOB Revolution SE Duallie Stroller is well designed with aluminum and chrome alloy. It is light in weight and you can easily transport and carry it anywhere. It comes with 2-step folding frame that can easily collapse. When it comes to seating, your kids can easily lay in the adjustable and padded reclining seats comfortably that can easily tilt by 70 degrees for taking a nap. The canopies are wide and can move in several positions to prevent rain, insect bites and sun rays. You can also monitor your kids all the time in its large viewing windows. It has four inner pockets, 2 pockets on the backseat and hanging basket for storage. So, you will have enough room to store your stuffs and your kids’ gear. Hanging basket is perfect to store your baby’s stuffs, backseat pocket is perfect to store your bottles and the inner pockets are best to keep your phone, keys and wallet. The BOB Revolution SE Duallie Stroller can easily be attached to the accessory adaptor so you can use it with other baby car seats. There are some complaints for BOB Revolution SE Duallie Stroller from some parents. One of the common issues with this stroller is that it is not suitable for kids who are tall because there are chances that their heads would touch the canopy and you cannot adjust it. It doesn’t come with adjustable handlebar so it is not good for tall parents too. To push the stroller, you may need to hunch over. It might lead to backache and can be uncomfortable. Overall, the overall performance of BOB Revolution SE Duallie Stroller isn’t affected by some negative reviews. A lot of parents found it as the best and most suitable stroller because of several advantages it has to offer. The advantages above say it all why it is the bestseller. Suppose you are trolling with both kids on tow. You are feeling the breeze and humming along for around 15 minutes or so. When you stop somewhere, a smooth leisure time may become nightmare if your kids feel restless or bored. Especially when you are alone in the midway, dealing with this situation can be annoying. This way, you need City Select Double Stroller. The seating arrangements are so well that your kids will love the comfort. The City Select Double Stroller features the reclinable seats so your baby can sleep well when he wants to nap and feels tired. When it comes to convenience, the City Select Double Stroller is engineered with the patented Quick Fold technology so you can easily fold this stroller without any difficulty at all. You can also fold this stroller with just one hand and you can hold your baby with other hand. With City Select Double Stroller, you will be able to keep your kids covered with its innovative multi-functional design. You can choose different seating arrangements of 16 combinations. So, you can definitely keep your babies from getting restless and bored. It has front wheel suspension with lightweight wheels. The sealed ball bearing can provide smooth and comfortable ride to your kids and you can stroll in the park and have light jogging with it. You can also take it into the mall. City Select Double Stroller also has some negative feedbacks like others. The parents found it heavy and they couldn’t found the compact fold at all. It is also not simple to transport because of its weight. Another major issue is its size. Some are quite unsatisfied with its expensive price. But you will naturally get good returns in the long run. Despite some negative reviews, the City Select Double Stroller is ranked among the bestselling double strollers. Parents love this stroller because of its performance. Some parents still invest on it despite the heavy price tag. As a parent, you will definitely want the convenience of having an easy to use, convenient and lightweight double stroller. You can do it all with Britax B-Agile Double Stroller. In addition, you can keep an eye on your kids. The Britax B-Agile Double Stroller can easily be attached to Britax baby car seat with its Click and Go Adapter mechanism. It also has receivers installed. This way, stroller can be easy to transport. Whether twins or not, your tots can grow in this stroller because it comes with several recline features. You can start using it just from the time they are infants and continue using it until they turn toddlers. It has supportive, padded seats to make the trip more pleasant and comfortable. It comes with large canopies to cover the kids from sun and rain. It also has mesh windows to keep an eye on your kids and they can also get the view of the scenery and proper ventilation. The Britax B-Agile Double Stroller comes with thread less harness system that provides added convenience to the parent and children. The supportive and padded seats have 5-point harness with easy to adjust head pad and you don’t have to unhook straps. Your kids can definitely enjoy smooth ride because of its front swivel wheels and all-wheel suspension. You can lock all the rear wheels at once and get the comfort grip from adjustable handle bar. This way, you can easily push the stroller. 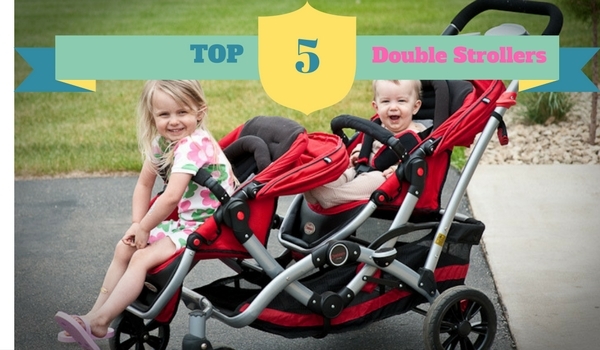 Some designs of double strollers are loaded with a lot of features but they tend to be bulky. You can definitely find the fix if you don’t have a lot of space in storage area or car. It is just 30 inches wide and is lightweight. It can easily be maneuvered into small spaces. Spacious storage basket underneath the seat to provide complete access to all the kids’ stuffs from the front footrest. You can also buy Britax B-Agile Double Stroller that comes with 2 drink holders and large container to store extra clothing, snacks, and diapers. It can easily be attached to stroller’s handle and handle can easily be adjusted for the width and angle to make it comfortable. When stroller is folded, the organizer can collapse conveniently so you don’t have to take it out. The Britax B-Agile Double Stroller is really a great choice for those parents who want something solid but comfortable for their kids. Many parents are happy with its convenience and performance. If you have children of over 6 months, mobility is very important in double strollers especially at the time when they turn toddlers. This way, Delta LX Side by Side Tandem Umbrella Stroller makes it easier to run errands and go out with kids. If you are with little kiddos, the stroller gives you great mobility and maneuverability especially in case you need to navigate along the narrow passageways and doorways. If you are stuck in door frames, it might seem a bit awkward for you. But you don’t have to worry about it. You can easily navigate along narrow spaces and tight curves and corners as well. Usually double strollers seem to be heavy and bulky. But Delta LX Side by Side Tandem Umbrella Stroller is the best choice for the parents as it weighs just 22.6 pounds. So, you won’t have any issue to transport it from one place to another. You can easily store it in any place by folding it. Delta LX Side by Side Tandem Umbrella Stroller is loaded with 360 Degree swivel and shock absorbers which can easily make your ride a safe and smooth breeze. It also has 5-point harness system which can hold your baby. It also has multi-position recline and shoulder pads to support your baby when she gets asleep and tired. It comes with European style large canopies that can protect and cover your kids from rain, sun and insect bites. The design of the canopies matches its style and look. The cup holder for parent comes with 2 attachments so you can easily hold your soda or water bottle and drink it on the go while taking the rest. It has two storage bags hanged aside to provide added convenience at the back where you can store baby essentials like clothes, diapers, bottles and other things. Another second problem is its canopies. It really works well with the whole stroller design and they cover not much sun. Some parents also complained that the wheels get stuck when the cracks come on sidewalks. The mid wheel tends to turn if not fixed. Sometimes, they end up dragging along. Irrespective of having some cons, the Delta LX Side by Side Tandem Umbrella Stroller is still a user-friendly and flexible double stroller because it is compact, lightweight and easy to transport and fold. You can easily go through narrow passageways or doors. As the name implies, it is not fit to carry a lot of weight and run on uneven and rough surfaces. It is designed to get certified by JPMA and it conforms to all the ASTM and CPSC standards. 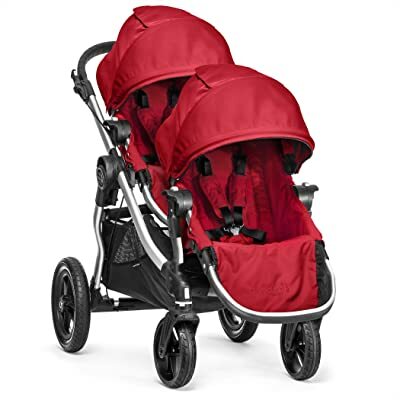 If you have two or more kiddos of different ages and you want to spend more quality time with them, it is good to buy a double stroller to fulfill all of their needs. All strollers come with cozy seats to provide smooth ride and sleep. The problem is when you have to keep your older child in it. He has learned to walk and he is more excited to look around what’s happening outside. This way, you should go for Baby Trend Sit N Stand stroller. When your older kid reaches at this active stage, you cannot let her lie down and sit. If you force her to do so, it would just cause tantrums. This way, the Baby Trend Sit N Stand gives needed space and independence. It is perfect choice for the parents because they can easily stand or sit their kids so they can observe the tranquil scenery and surroundings. Your baby will definitely be pleased with comfortable front seat with which they can be kept warm and snug fit. You can easily get stress-free stroll without any hitches. For your children, safety is the first concern. The stroller is loaded with 5-point safety harness to strap your child safely and you can easily avoid any risk of falling or slipping. Sometimes strollers accidently careen or run off from parents. But this stroller has rear brake controlled by your foot so you can easily avoid dangerous cases to happen. Stroller is particularly designed to lead a happier life because you can easily transport your baby with ease. You can easily fold the Baby Trend Sit N Stand double stroller. You can also be able to fold the stroller with one hand. Gone are the days when double strollers were bulky. So, forget the awkward moments when you had to use both of your hands to fold bulky strollers. If you are going outdoors for a stroller in summer days, you and your kids may have to deal with intense heat of the sun. This way, you can go for Baby Trend Sit N Stand because it has two canopies you can rotate to cover both of your kids and save them from harmful sun rays. They also protect your kids from insect bites and rain. It comes with two inbuilt cup holders and parent tray covered inside. If you want to rest in while strolling, you don’t just have to see your kids having their snacks and milk. You can get the same experience while drinking and eating comfortably. You can also store your purse, keys and cell phone in a separate compartment. Extra large basket with enough room to store both your gear and your kids’ gear alike. The storage baskets are one of the most common problems for many parents in Baby Trend Sit N Stand stroller. When it is big for some, it has not enough space to hold diaper packet. When latch is folded, it makes it harder to turn the basket with one hand. Baskets are open so things tend to slip out at the back. Due to the elder kid’s footrest, it becomes difficult to access basket. So it is difficult to get in and out the gear. Another major concern is Sit and Stand feature. You have to completely remove the seat and it has no back rest expect the trap. Another major problem is that it is little heavier and bulkier. Irrespective of having some flaws, Baby Trend Sit N Stand double stroller is a great bet as you can easily resolve most of its issues without a hitch. These double strollers come with 3 wheels that are more suitable for active parents who walk faster. You don’t need to be an athlete to buy this stroller. In fact, it is designed so well that it can easily navigate along uneven surfaces. Only problem is that it lacks maneuverability. This is, perhaps, the most popular variety of double strollers. As the name suggests, this double stroller allows both of your kids sit while facing one another, unlike tandem stroller. The main problem with this stroller is its width and it is harder to get through the narrow pathways. However, several makers are making this type of stroller narrower. They are a bit more streamlined and the seats are arranged in one single file, unlike side-by-side ones. 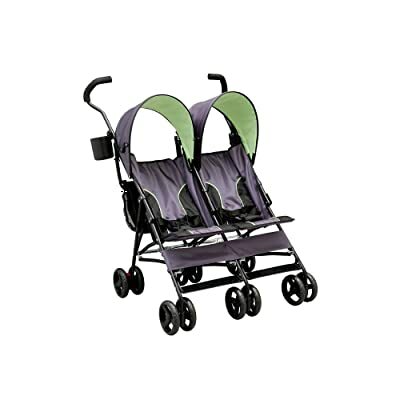 Basically, all-terrain strollers come in tandem format and they are perfect for jogging. However, single file seats, sometimes, reduce space for the toddler in backseat. If you want a stroller that is as strong as double jogging stroller but can easily maneuver, you should go for all-terrain strollers. It is something like SUV in the world of strollers. You can lock the front wheel of these strollers. This type of stroller is engineered for those parents who are planning second baby. The sit and stand strollers allow older child stand up in the back and the younger and little one can sit upfront. Seating arrangement is well planned for kids of above 2 years of age. They can easily sit when they feel tired. Since older sibling can stand, these strollers give added freedom to them. For those who are lacking space at their small apartment or condo and looking for something that can easily be folded within seconds, this is the best choice. As the name suggests, such types of strollers can easily fold up like an umbrella within a few seconds. They also have angled and curved handles. However, they are not fit for infants because the seats cannot get lower on totally flat position. 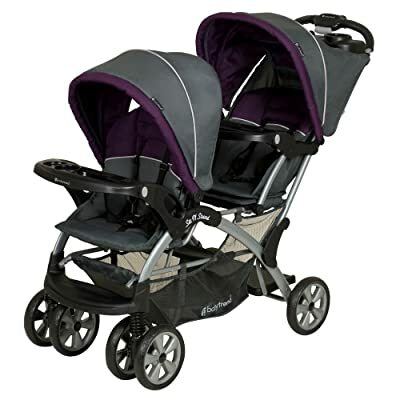 How to Buy Double Stroller? If you are going to buy a double stroller for your tots, make sure to keep in mind the proverb “knowledge is power” to make informed decision and avoid regretting your decision in future. You can consider some of the basic things too if you want to buy a best stroller. First of all, consider how often and how much you want to use the double stroller. Perhaps, it is the most important question because you can figure out the budget and type of stroller you want to buy before making any decision. Are you going to use every day or just once in a week? Will it be used just for 5 minutes from your home to grocery store? Will it be used for long walks in summer months? With having rough estimate of how often you would use it, you are just about to establish your budget. Another thing to consider is the duration of time you are going to use for. Ask yourself such questions to determine the frequency of using it. Would you use it for one year or until they turn toddlers? If it is so, you might like to search for double pram because it will accommodate you properly if you don’t need seating that can let them sit up. This is probably one of the most common and basic factors you need to consider when it comes to own a double stroller. As far as price is concerned, you can find different varieties of strollers. You can find strollers on the budgets ranging from $100 to around $1000. Most of the quality strollers come under the range of $200 to $300. When you go higher, you may buy the strollers that fall under $1000 to $1200. Several double strollers come under $100 but they are designed for those who are barely using them. 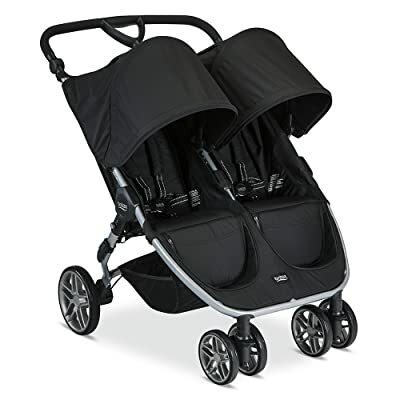 However, the range of $800 to $1000 might not make sense because most of you don’t need the extra features that come in these strollers. This review is for those who want strollers from low to mid range. So, we are considering these strollers more than expensive ones. Technically, you will get more durable stroller with more features if you invest higher in double stroller. On the flip side, you may go for low range if your budget don’t allow. So, here is all you should know about! This is the information you should know about double strollers and you will get all the features required for proper amount of durability. By considering these ideas, you will get everything you pay for. You won’t have to sacrifice lightweight and compact strollers for the sake of durability. The best deals are awaiting you at shopping sites, such as Amazon. We hope this review would help you make informed decision and get closer insight about double strollers.